After many successful years a lot of major shopping centers are facing difficult times at the moment. Their shopping concept no longer meets nowadays needs. Shopping is more than ever a recreational activity and therefore should be very pleasurable. Additional activities and various functions are becoming an integral part of shopping. Nevertheless declining amount of visitors worsen this situation even more as these places loose their function of a social meeting - with less visitors, more shops become vacant spinning the shopping center into a downward spiral. To turn this process around Placemaking plus started to work on this shopping center as the placemaking project was initiated. DAK Schalkwijk is back! And this year not only on the roof of the parking garage (DAK park), but also in the shopping center: DAK indoor! Until August 31 a program full of sports, music and food! The roof of the parking garage has been transformed into a unique chill-spot called DAK-park. For a nice BBQ or a cozy picnic. Sports, laser gaming, dancing, watching movies, airhockey, racing and much more. The entrance is on the outside of the shopping center on the Costa Del Sol (opposite the FEBO). After first successful season the second edition of DAK started in the summer of 2017. This year 5 week long project on the vacant parking lot offered even more activities and even better quality events. The range of things to do there was aiming to different groups of people and included variety of activities from debate club for kids, drawing, science club, beauty classes for girls to bootcamp and everyone's beloved basketball with Triple ThreaT. Adults were also not forgotten and could enjoy weekly live concerts with low budget food options. DAK is a meeting place for and by Schalkwijkers. Few weeks ago we opened OnderDAK in Schalkwijk shopping center! Continuation of DAK project, OnderDAK invites people to enjoy indoor meeting point with multipurpose floor, stage, picknick tables and a lot more. Triple Threat started as a youth initiative Schalkwijk giving young people the opportunity to come into contact with their passion in an accesible way. The Triple Threat project consists of a large group of youngsters from Schalkwijk who volunteer for the benefit of the project, the neighborhood and district. 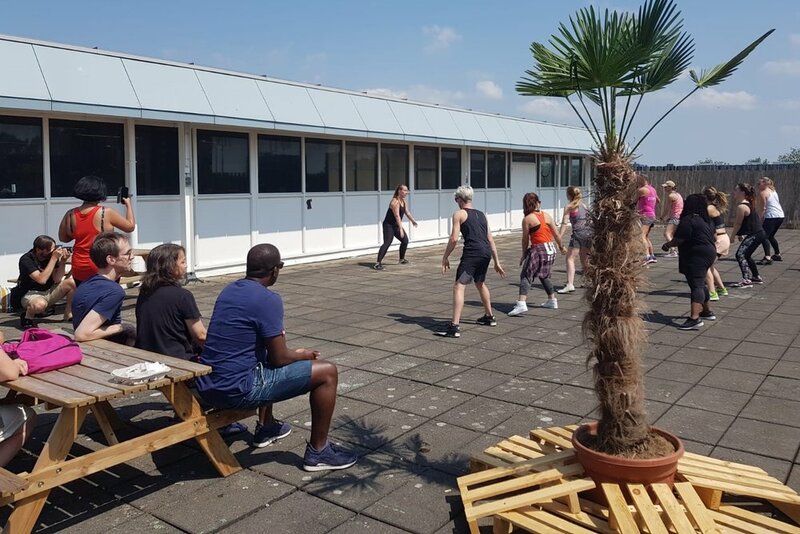 An inspiring project in cooperation with the owners of Shopping Center Schalkwijk, the Shopkeepers Association, The City of Haarlem, Triple Threat Community, Dock Haarlem and more. A tremendous turn-around in one year; from space to place! The Triple Threat project began in 2009 and offers easily accessible activities in which the youth can get acquainted with the different elements of basketball, dance and lifestyle. Sport is hereby used as a means to enable young people and their passion (in this case sports) to get started. Triple Threat has become a great success and has now been able to reach thousands of people with different projects, events and workshops. The Triple Threat pop up store has been established in the centre of Schalkwijk. In the past two years Placemaking has contributed to the realization of DAK and OnderDAK! The Placemanagement team played an important role in this. DAK and OnderDAK are initiatives that will be continued in the coming years. This year and also in the coming years, there will be plenty of building and rebuilding in and around shopping center Schalkwijk. In order to keep the center attractive in this phase, Placemaking is, perhaps more than ever, an effective tool. We emphasized the Placegame on the public space outside the shopping center, in particular to increase the quality of the outdoor space and to strengthen the connections with the surrounding neighborhoods. Full placegame report can be found below or download it (in dutch language). What once was a lively meeting and shopping area was not long ago a deserted area by the decline in visitor numbers. Many residents did not feel welcome at the mall and the empty plinths did not do the atmosphere in the mall any favors. The owners and operators knew they needed to make a drastic change and at the end of 2015 they initiated a placemaking project. There have been many achievements since the placegame, but the greatest success of all is that everyone feels at home again in their shoppingcenter. Full placegame report can be found below or download it (in dutch language).